As the wet season draws to a close, we leave behind the heat and humidity of April, and enter the easy warmth of May. It’s a quieter and more tranquil time. May, June and September are considered the best times to come to Bali, but personally I consider anytime is the best time to visit. A perfect time to sightsee and enjoy the outdoors in the pleasantly warm weather. Whats new at Aquaria in May ? So for all those of you who want to be closer to the ocean but still at a poolside price then in May we will be changing the Ocean View Apartment into two Poolside Superior rooms, both with airconditioning and king American beds. These two rooms have the larger terrace with clear views to the ocean only 20 metres away. For those who still want the family apartment, you can still connect them, so write to Glyn and he will work out the best price for you. See more in the June 2017 Edition coming next month. Many of our lovely returning guests will be coming to stay in May. Did you know that you can get a long stay at Aquaria off season at a fraction of the cost. We have one guest who is staying 60 days.... Another guest stayed for half the normal rate for 7 weeks in February...... Yes its possible to have long stay holidays at Aquaria. Did you know we also own a villa nearby? It has 3 bedrooms, 2 bathrooms, and pool, with great indoor outdoor living.You can book to stay there in May and June or September October November.......and still enjoy all the facilities of Aquaria with your Aquaria Club pass. This villa is also for sale at AU$249,000. The manager - Ketut has told me that the ocean project is nearing completion. He says that it has been slow progress as he will not allow workers to work whilst guests are in house, but he is hopeful that the new lounging terraces will be ready for Aquaria's 10th Birthday celebrations in June. "Aquaria has a good atmosphere with great staff teamwork. I love the diversity of the staff. They are all different but I can help to handle them so we can be a team even if they are very different minded". 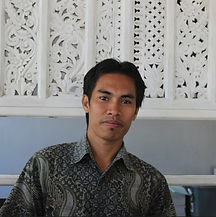 Ketut was our very first member of staff, looking after us and managing the renovation project. His honesty, integrity and organisational skills along with his sincerity and spirituality led us to choose Ketut, over more experienced applicants, to run the operations at Aquaria. He was out of his comfort zone many times, but we have been amazed at how he has grown, and handled all obstacles with his own style and philosophy, whilst trying to understand ours. Ketut’s special birthday offer : Ketut is vegetarian and doesn’t drink - so enjoy a Cap Cay (a delicious meal combination of mixed vegetables) on him. 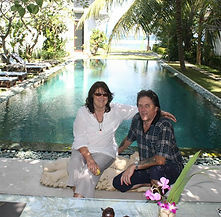 Glyn sold his dream property, (the one he had been renovating for 5 years), left his 5 acres and ride on mower, to pack up and go with Jeni on her spiritual journey to Bali. That’s the type of person that Glyn is - special, kind, thoughtful, and he puts other’s needs first. His earth energies balance and ground Aquaria and support Jeni. Glyn has learned to go with the flow he walks lightly through life without ego, without the need to collect things. He loves to share our journey with others and although shy and a little reluctant to be in the limelight, once he opens up, you can’t stop him. He seems like the typical Kiwi bloke,with a wicked sense of humour, and a taste for the Bali Bintang, but when you get to know him, you will learn his philosophy and connect with his deep and spiritual wisdom..
Glyn’s special birthday offer: Have a Bintang with him (or without him) and a glass of local wine for the ladies. Words from Krisna : " I love working here because it is a different place to work than others. Here is a family, making guests happy is the best part". Krisna came from tourism training school as a trainee chef, working originally at our Refreseh café in town. He was already married to a beautiful girl and had a baby on the way. Now he has 2 beautiful children, and has become a responsible family man and his skills have grown, and grown. He is a pleasure to teach, he has a retentive memory, and a great command of English. He is a calming influence on the kitchen and is wonderfully patient when guiding others. We love the way he takes time to gather his thoughts and equipment together before rushing into preparation. His Chinese Buddhist background, his easy going nature, and his sense of humour, help us to maintain equilibrium and balance at Aquaria. Krisna's special birthday offer: Krisna wants you to try his crispy zucchini balls, deep fried with feta cheese centres. Aquaria will be celebrating its 10th birthday in June! Guests staying during the first week in June will be invited to join in the celebrations. Last year, Aquaria celebrated it's official 10th birthday, to mark the 10 years from when the renovation started, with a special dinner for the staff, featuring delicious suckling pig! This year officially marks 10 years of opening: I wonder if Aquaria will be doing the same this year? From what I hear they will be holding a special dinner for staff and guests similar to their New Year feast, but I am yet to know the date. Oh how I wish I was there to join in. For me, Aquaria is a slice of heaven. After coming once and never thinking of going elsewhere, ever - I realised why. It is incredible, the staff are my family, the bosses put everyone first and I am completely at home when I am there. It is now my privilege to keep others updated on Aquaria so that when they are far away they feel they are close by just as I do. There appear to be less ceremonies this month, after the festivities of Nyepi, Galungan and Kunningan on the calender but see below for some events across Bali in May. 20 Tumpek Krulut- respect to bronze - instruments (gamelan), dance costumes and masks offerings laid upon gongs and the holy water is given to the instruments, with some offerings tied to the smaller instruments. The Aquaria Team wishes you all a safe month wherever you are. We thankyou for reading our blog this month. Please like us on our Facebook page and review us on Trip Advisor during your stay!